The yellow cab is a striking metaphor for New York City and its exuberant twenty-four-hours-a-day rush. But just as the city has changed in recent years, so too has the industry that keeps it on the move. 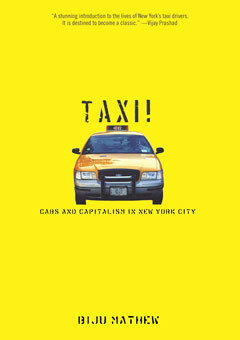 As Biju Mathew reveals in this fast-paced survey of New York’s taxi business, just about everything has changed dramatically except the yellow paint. An immigrant working class in an industry that pioneered outsourcing, taxi drivers have a tough job with long hours and low earnings. The recent fare hike represents a major step forward for them. Behind the victory is a long campaign by the Taxi Workers Alliance, of which Mathew is a volunteer organizer, stretching back to the 1998 strike against the harassment of Mayor Rudy Giuliani. The scale of this action, with 24,000 drivers participating, was achieved despite the diversity of a workforce that speaks at least eighty different languages. Drawing extensively on Mathew’s interactions with the drivers, Taxi! is as much a critical commentary on globalization, urban renewal, migration, and multiculturalism as it is a captivating account of the struggles and triumphs of life behind the wheel. Buckle up, sit back, and enjoy the ride. Biju Mathew is a co-founder of the New York Taxi Workers Alliance, an associate professor at Rider University, and a co-founder of the Forum of Indian Leftists (FOIL). He lives in New York City.